When you have children, you are constantly on guard to make sure that they are always safe. 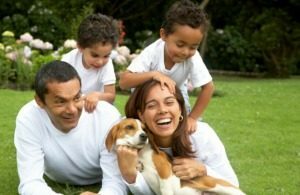 Choosing an appropriate family pet is something to consider. Here are five kid-friendly dogs you may want to take a look at. 1. The Bulldog is a great dog for kids. Bulldogs are muscular and sturdy allowing them to withstand a lot of rambunctious activity. They are quite mellow and slow moving – you will not have an “ants in your pants” dog if you choose to purchase or adopt a bulldog. Bulldogs do require regular baths as they tend to have sensitive skin. 2. The Beagle is also wonderful family dog. Beagles are friendly and tend to be a good nannies, warning you of crying, movement, or danger. As a bonus, their energy levels will likely wear out even the most active of children, making for a quick bedtime! Like the bulldog, the beagle requires some maintenance when it comes to grooming. And they also howl, so take this into consideration. 3. The Bull Terrier is highly intelligent, friendly and energetic. These dogs can handle wrestling with your kids and won’t turn aggressive. They make great baby sitters and will protect your children at all costs in any situation. 4. The “Lassie dog” has been a beloved dog for ages, and when you interact with collies you can understand why. They genuinely strive to please their owners and are eager to learn. Collies can be easily trained to do numerous tasks, and will keep your children close to home with their herding tendencies. Their long coats do need to be brushed regularly to avoid matting. 5. The Newfoundland loves children! Although these dogs are quite large, they are gentle in nature and form strong bonds with their family. They will remain by your side and love you immensely. They do shed and drool a little more than average and require a bit more room. This is not the best dog for apartment living. Any of these dogs would make a great addition to your family. Remember to check with local shelters and rescue sites, where you will find many of these dogs, any one of which would be happy to get a forever home. Here’s to doggy love and ownership!